Indeed, it was only in 2017 that both countries inked a memorandum of understanding on defense cooperation, which was a testament to some of the changes in Philippine foreign policy we had seen under President Rodrigo Duterte. The landmark development came during the commemoration of the 60th anniversary of the establishment of diplomatic ties and amid the holding of just the second iteration of the wider Joint Commission for Bilateral Consultations (JCBC), with the first iteration dating back to 2011. Earlier this month, the developing defense aspect of the relationship was in the headlines again with the holding of the inaugural iteration of the Philippines-Cambodia Joint Defense Cooperation Committee (JDCC) Meeting. The meeting took place from March 11 to March 14 in the Cambodian capital of Phnom Penh, and it was chaired by Defense Undersecretary Ricardo A. David Jr. and Neang Phat, the secretary of state of the Cambodian defense ministry. The meeting itself consisted of several aspects, including taking stock of ongoing collaboration, discussing future areas of cooperation and finalizing engagement activities agreed upon, and discussing regional and global issues of mutual interest. 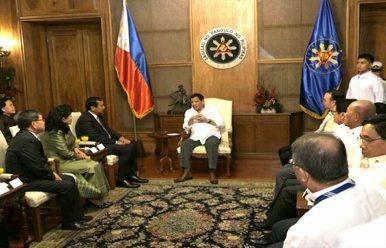 Per the official Philippine account, the meeting addressed issues that included cybersecurity, counterterrorism and violent extremism, and peacekeeping. Unsurprisingly, few additional specifics were disclosed about the nature of the private deliberations and even on the particularities of future engagements. And to be sure, the holding of the inaugural defense JDCC meeting is just one of a string of developments within the bilateral relationship. Nonetheless, the aspects of collaboration that both sides work on in the coming year will be interesting to watch, up to the next iteration of the meeting which is scheduled to be held in Manila in 2020. Vietnam-Philippines South China Sea Activity in Focus With Naval ExchangeJapan Destroyer in the Philippines Amid Big Maritime WeekA Big Week for Japan-Philippines Defense TiesNew Military Aircraft Puts Japan-Philippines Defense Ties in the SpotlightWill the Philippines Ever Realize its Submarine Dream?